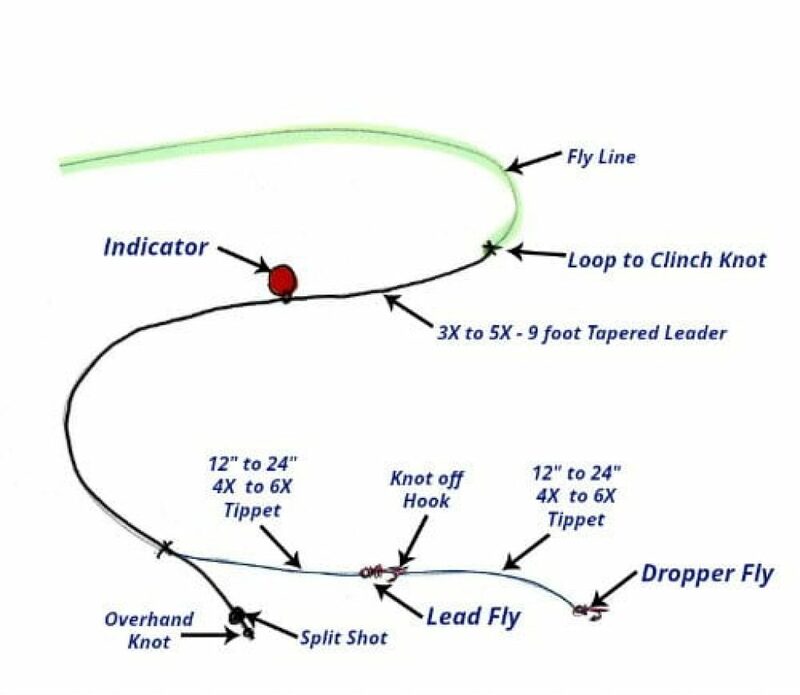 There are so many different tools you can use to be more successful with fly fishing, and a strike indicator is one of them. However, the first few year of fly fishing I knew nothing about strike indicators. A Strike indicator is a float attached to a fly line that suspends a sinking fly called a nymph. The strike indicator allows the fly fisher to see when a fish strikes the sunken fly. It is similar to a bobber, except that it is specifically designed for use in fly fishing. One of the most challenging aspects of fly fishing is knowing when you have a fish on the line. By nature, the fly line is rarely tight. There is typically lots of slack in the line as you drift your fly through your target area. Strike indicators are floating objects that can be attached to your fly line. When you have a fish on the line, it will start moving or bob up and down. It works similarly to a bobber on a standard fishing line. However, strike indicators are specifically designed for fly lines. You may have lots of questions about strike indicators like I did when I first found out about them. There are several different types of strike indicators, and you may use them in different ways. You will need to know how to install a strike indicator and where on the line it should be attached. You will need to know why type of flies require a strike indicator. In the end, once you learn what you need to know you will have more success with your fly fishing. The first strike indicators were made of cork, and you can still find lots of cork indicators. They have a high rate of buoyancy, but they can make it tough to attach it to the leader. Most fly fishermen have moved on to other types of strike indicators. The second type of strike indicator to come along was the yarn indicator. These are very easy to see and are super sensitive to nibbles and strikes. They are great when fish are not striking hard. Yarn indicators are ideal for small flies and for casting into the middle of a current. You will want to apply floatant to these to keep them at the surface. They are the most sensitive indicators you can buy. Casting with a yarn indicator is super easy. They hardly weigh anything, so your cast will act just like it does with no indicator. It is so light you can even use these on tiny dry flies like midges, tricos, and Baetis. For a long time, all yarn indicators were made of poly-yarn and they come in about every color and are easy to customize. However, in New Zealand fly fishermen have typically used wool-fiber yarn. This is becoming more popular as a New Zealand company invented an attachment system that uses rubber tubing to avoid hinging your leader. In addition, you will get little water resistance on your line when bringing in a fish. Larger, heavier indicators can put added pressure on a line which can make it more likely to snap your line. However, yarn indicators may not work with bigger flies as they might not be buoyant enough to support the weight. If the indicator sinks, it does you no good. You also should avoid using a yarn strike indicator in fast currents. Closed-cell foam indicators are also light and barely affect your cast. They often are as easy to attach as folding a piece of tape around the leader. These indicators do not cost much, and they require no floatant. They float better than yarn indicators, so foam indicators may be a better option for heavier flies or rapid currents. You can even attach multiple indicators to make them more buoyant. These come in bright colors, but they are not adjustable. Once they are attached, they are staying in that spot. You may also get a sticky residual after removing these indicators. They do tend to fall off over time. However, you can sometimes find a turn-on foam indicator that attaches with a rubber band. This one will stay on well and is fully adjustable. However, it can be hard to attach if your fingers are numb. The bubble rig was first invented just under 20 years ago. The first one on the market was the Thingamabobber. They are super sensitive, super buoyant, and easy to see. They consist of a hollow plastic ball that takes its general concept from fly fishermen that used to use small balloons for strike indicators. These are very easy to attach and work well with nymphs. The black and glow-in-the-dark indicators are a favorite as they have a low profile and are likely to not spook fish. However Thingamabobbers, do leave a slight kink in the leader. You can straighten your leader after it is removed, but often it has left a worn spot that is now weaker. Some fly fishermen feel that the fish can feel it on the line, that it makes your line more prone for tangles, and that you get added resistance when fighting a fish. Recently a modified bubble indicator was invented that uses a small plastic screw nut to secure the indicator to your line. This prevents kinking in the line and makes it easily adjustable, but also gives you all of the benefits of any bubble indicator. For anglers that do not like suspension indicators, sighter indicators may be the best option. It is simply colored monofilament that you attach to your leader to make it more visible. You can get them in yellow, white, pink, red, and chartreuse. The leader is attached to the indicator, and then the tippet is attached to the other end of the indicator. Floatant is applied to add buoyancy, but you can sink this indicator mid drift to make your fly presentation more effective. It gives you the most options for fly presentation. However, with sighter indicators you cannot make long drifts. These do not work with too much slack in your line. You do need to use a longer leader with these indicators, and some anglers do not like this. Each different type of strike indicator will attach to your line differently. Sighter indicators will be tied into your rig just like your leader is. Yarn indicators will sometimes be tied to your line and sometimes will have an attachment piece as part of the indicator. Many bubble indicators will attach with a rubber band or with a bobber-style attachment. As for where to attach the indicator to the leader, it depends how deep you want to fish. If you want to fish toward the surface, attach your indicator one to two feet from the end of the leader. If you want to fish deeper, attach the indicator further from the end of the leader. This is the advantage of indicators that are adjustable. You can change the depth at which you fish, so you can adapt to your specific fishing scenario. Do I Need a Strike Indicator to Fish a Nymph? The short answer is that you never actually “need” a strike indicator. However, it requires less skill to catch fish with a strike indicator than without. You will typically have more success using one. Specifically, with nymphs this decision should be based on the size and weight of the fly. Smaller, lighter nymphs will work better with strike indicators. Larger, heavier nymphs will sometimes drag your indicator under the surface of the water. If you want to be sure this does not happen, go with a high buoyancy indicator like a bubble indicator. In addition, you will want your indicator relatively far from the end of the leader to ensure that your nymph gets to the proper depth. These flies are intended to be fished deeper than other flies, so it is vital that you get the fly to the proper depth. Apply Fly Floatant to your indicator to help it float. When using a strike indicator, you typically want as much buoyancy as possible. Adding floatant can only help get you the best buoyancy possible. Football shaped indicators cast a lot easier. These indicators have less wind resistance and are typically foam indicators, so they are light. They are also easy to install and are fully adjustable. They offer minimal water resistance when bringing in a fish. Use the smallest indicator possible. Keep in mind that any added weight and resistance can affect your cast and can affect your retrieval. Smaller is better when it comes to strike indicators. Try different color indicators. Different people can see different colors better. Try out several different bright colors and see which one is most visible for you. Find an indicator that is easy to attach. Remember that often your fingers will be cold and numb when you are attaching your strike indicator. If the indicator is difficult to attach, you may get frustrated and end up just fishing without it. Find one that is easy to attach even when your hands are cold. You will find that fishing with a strike indicator will almost always increase the number of fish you get in your net. However, the one you select is largely a personal preference. Strike indicators are relatively inexpensive, so buy a few different types and try them out. You will quickly figure out what you like and what you don’t.